An old stone pub with stunning views of Tintern Abbey, the Anchor Inn has recently been refurbished and is extremely child-friendly with a large pub garden including climbing frame and swing opening out onto the village green. The food is good pub grub; the only watch out is that it can be extremely busy at weekends and during the summer and service can sometimes be a little slow. Booking highly recommended. 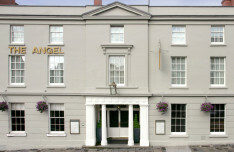 The stylish Angel Hotel in Abergavenny caters for everyone, whether you want to pop in for a sandwich or have a cocktail. Sharing platters particularly recommended as huge and delicious! Open every day from noon except Tuesdays. The Boat Inn is situated right on the edge of the River Wye overlooking the old railway bridge that crosses from Redbrook to Penallt. With live music every Thursday night, they also stock a range of locally produced ciders, beers and wines. 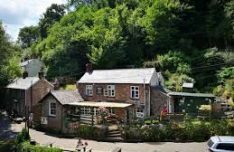 The Globe Inn is a traditional pub and restaurant located in the village of Alvington, on the edge of the beautiful Forest of Dean and close to the Wye Valley. 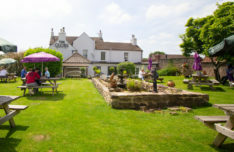 It is a traditional yet modern free-house and restaurant where the staff are passionate about good food and use locally sourced and seasonal produce wherever possible. They also have a good range of cask ales, lagers, ciders and wines. 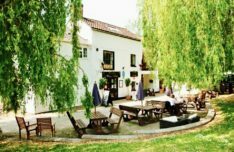 The relaxing bar and restaurant areas feature oak beams and a log fire and for the summer months there is also a large sunny beer garden. 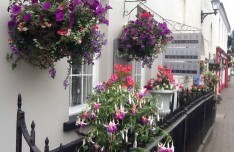 Green and Jenks Gelato House is in Agincourt Square, right in the centre of the historic border town of Monmouth. The gorgeous Georgian town house has a cosy seating area leading into the sheltered sunny outdoor terrace, the perfect place for a coffee and a gelato. Choose from a range of delicious freshly made gelato, sorbets and frozen yogurts made on the premises. The menu changes regularly but they always offer a range of classic flavours, seasonal specilaities and some of unique flavours made to a secret recipe exclusively for Green & Jenks customers. 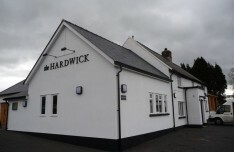 A top, award winning restaurant in the area, near Abergavenny (30 minutes’ drive from Penhein), The Hardwick has a great atmosphere, always buzzing and without fail, excellent food. 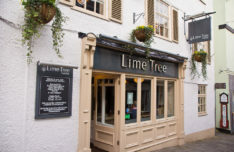 Situated on the lovely pedestrian street of St Mary’s in Chepstow, the Lime Tree is open all day with food served throughout. 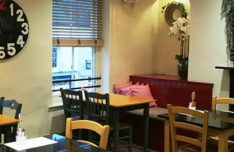 With a wide selection of food from tapas to burgers, this is a nice option for eating in Chepstow. 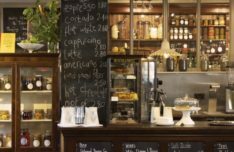 Enjoy a light lunch or excellent cup of coffee at Number 49 in one of the many rooms surrounded by their excellent selection of home furnishings including lighting, ornaments and furniture or in the attractive garden. Well worth a visit if you’re in Usk. The Old Chapel serve everyday, simple and delicious food. They make granolas, yoghurts and compotes, jams, marmalades and curds. The menu has generally evolved from their garden produce, using pickles, preserves, cordials, chutneys and bottled fruit all made in our kitchen. A variety of wholesome breads are made daily – rye and gluten free. Biodynamic wines are available, craft ales and small batch roasted speciality coffees. 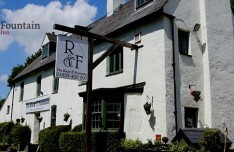 This lovely old pub is on the edge of The Forest of Dean and well worth a visit if you’re in the area.  It is known for its excellent food and features in most good pub guides. The food is home made and there is a good variety. There are also up to 8 local ales available on tap. In the summer months there is a lovely large walled garden. 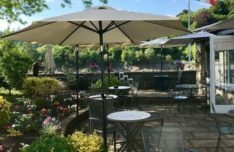 Panevino Restaurant is situated on the banks of the River Wye between Chepstow Castle and the Old Wye Bridge linking Wales and England. The Grade II listed building is known locally as the Afon Gwy built c.1735 and features in Turner’s painting of Chepstow Castle. They serve a varied menu of good, honest Italian food and the restaurant is fast becoming one of the nicest places to eat in Chepstow. 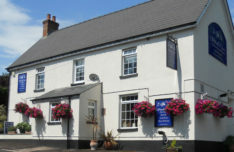 Family friendly pub close to Chepstow race course with food to suit all tastes. Although called a wine bar, The Riverside Inn also has an extensive mediterranean based menu, with tapas and full meal options. Based in the centre of town this is well worth a visit. Just a few miles from Penhein, The Rock and Fountain is one of our locals. The ethos behind it is that families can enjoy incredible food at an unbelievable price. For example, there is a varied menu from which you can choose two courses for only £12. The food is simple, quick but well cooked and as a result popular so booking is essential. 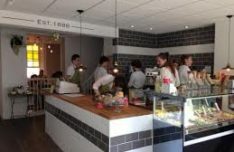 This nice coffee shop and restaurant is part of the cook shop Salt and Pepper in Monnouth, with a continental-style roof terrace, offering a menu with locally sourced ingredients. They also have a Weekly Specials Menu, bringing a touch of seasonal home-cooked favourites to Monmouth diners. 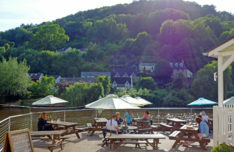 The Saracens Head Inn is situated on the banks of the River Wye at Symonds Yat. Always busy, the food is delicious, the atmosphere is buzzy and it consistently gets great reviews. Well worth a visit. Booking advisable. With stunning views over the Monmouthshire countryside, The Stonemill in Rockfield, provides exceptional food in a rustic setting. 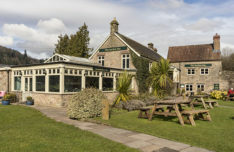 The converted mill is simply decorated which adds to the enjoyment of the food with excellent service. 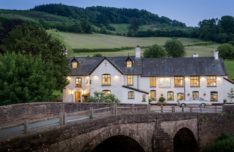 A former 17th century coaching inn, on the banks of the River Monnow, The Bell at Skenfrith is an award winning restaurant includng the ‘Best Place to Eat – Pub’ in the Wales National Tourism Awards. 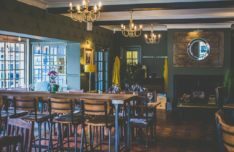 Oak beams, polished flagstone floors, open fires, classic and contemporary furniture coupled with comfy sofas and chairs creates a relaxed, easy atmosphere.The produce is seasonal and locally sourced. 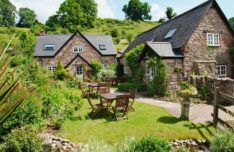 In good weather, guests may eat on the garden terrace or order a picnic basket and rug and sit up in the orchard which has amazing views over the Monnow river below. 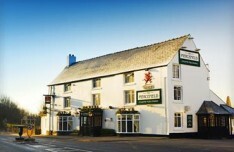 The Royal George at Tintern has a pub – The Wild Hare and a restaurant – The Port Pantry. 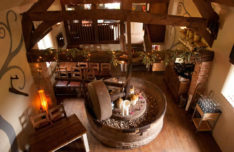 At the Wild Hare you will receive a true countryside pub experience alongside locally sourced, seasonal menus. With comfy sofas and a cosy log burner, it’s a great place to enjoy a delicious meal or a pint of local beer. The Port Pantry is an elegant and contemporary restaurant and Head Chef, James Lyons will take you on a culinary journey through a series of seasonal menus paired with a selection of drinks from the well-stocked bar. 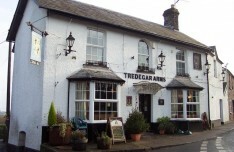 In the pretty neighbouring village of Shirenewton (3 miles from Penhein), The Tredegar Arms serves traditional hearty pub food in a relaxed atmosphere. Tatler magazine described The Tudor Farmhouse as a “culinary oasis”, so why not try them for breakfast, lunch, afternoon tea or dinner and see for yourself! There is also a Lunch Menu available from 12noon to 2pm every day which includes a delicious roast option on a Sunday. 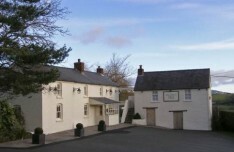 This Michelin starred restaurant on the outskirts of Abergavenny (35 minutes’ drive from Penhein) offers exceptional food and wine – a true foodie’s delight. Be sure to book in advance! Open 5 days a week for lunch and dinner. Closed all day Monday and Tuesday. 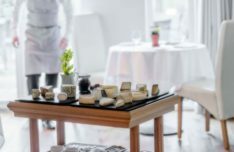 This wonderful restaurant has already won a clutch of awards, including a Michelin star, 4 AA Rosettes, AA Wine Award for Wales, Inspectors’ Choice at the AA Hospitality Awards 2017 and a place in the 2017 Waitrose Good Food Guide Top 50 UK Restaurants. Their passion is to deliver flavour, creating new menus using the freshest ingredients. The team prepare original dishes using locally sourced food flavoured with freshly foraged herbs – every dish on his menu, from breakfast through to dinner, features a foraged ingredient. 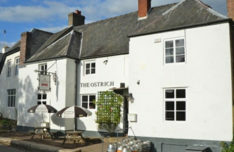 This is our local pub – only about 30 minutes’ walk from your alachigh or a short 3 minute drive. Owned and run by Keith and Sue all food is cooked to order with a particularly good range of fish options. If you can’t bear to leave your alachigh they do exceptional fish and chips to take away.